A charming property on a stunning location, Silva Beach Hotel is everything a holidaying tourist would want. Situated on the outskirts of the bustling city of Hersonissos, Silva Beach Hotel is just down a beach path from the hotel. A lively shopping area close to the hotel gives plenty of shopping choices to the tourists. The hotel complex also has a bus stop just outside its building allowing easy connectivity. Silva Beach Hotel building has three floors with a lot of rooms, apartments and studios for the guests. A 24-hour reception desk is always ready to help the guests. They provide a safe and currency exchange. A beautiful swimming pool with children’s paddling areas and a poolside bar is the main highlights of this property. 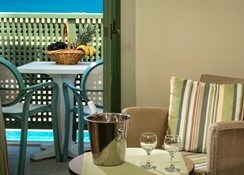 Guests can reach Silva Beach Hotel via the Chania Airport at 212 km and the Heraklion Airport at 20km. located just adjacent to the beach, Silva Beach Hotel is aptly named and provides easy beach access to the tourists. 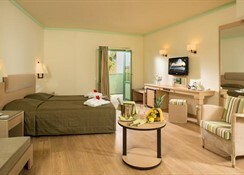 Guests can choose between the studio or the apartment type room here. They are tastefully decorated and designed. One can find en-suite bathrooms with bath, hairdryer and toiletries. A direct dial telephone, satellite connection TV, electronic safe on hire, internet access and a radio in every room. The apartments and studio type rooms also have a combined lounge/bedroom with a kitchenette and fridge. 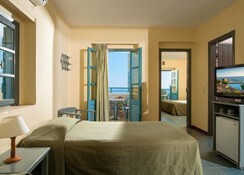 The apartments also have a separate bedroom along with a balcony or a terrace. 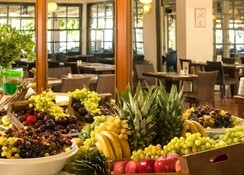 Guests can select their breakfast, midday or evening meals from buffet and go in for a la carte for lunch and dinner. The hotel provides special diet menus on request. There are three cozy cafes and three restaurants here service delectable fare. The restaurants have high chairs for kids and non-smoking areas too. Guests can avail benefits of the hairdresser’s salon here. There is a small supermarket for daily needs. A nightclub in the property is the place to get grooving to some foot tapping music. Apart from these, there is a also a theatre room and a games room and some other shops for the hotel guests. A lush outdoor garden with a swimming pool and a poolside snack bar is the main attraction here. Sun loungers and parasols can be found by the pool side. For the sports enthusiasts, the hotel offers table tennis, miniature golf and billiards. One can also indulge in aqua aerobics and gymnastic courses. The hotel arranges for an activity program for the guests’ entertainment. The golf course is also quite nearby at 6 km from here.